Meet Maddalena Laura Lombardini Sirmen. According to Wikipedia, she was born in 1745 (roughly a decade before Mozart) and she died in 1818 (roughly a decade before Beethoven). We don't know a lot about her. But what we do know is fascinating. She was a violinist, composer, harpsichordist, singer, and businesswoman. When she was 21, she married another violinist and composer named Ludovico Sirmen. Ludovico eventually became involved with a countess, while Maddalena traveled across Europe with a priest. She performed in many of the cultural centers of her day, in the process overcoming a widespread societal antipathy toward professional women. But unfortunately, if predictably, her career has been largely forgotten. In fact, if her name is ever mentioned today, it is invariably because her teacher was Tartini (he of Devil's Trill fame), and he once wrote her a famous letter about violin technique. 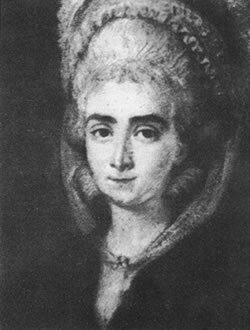 But Maddalena Lombardini Sirmen was so much more than a Tartini student. In later blog entries, I'll try to fill in some more of the details. But it'll take some time and detective work. Maddalena has had an IMSLP (International Music Score Library Project) page since May 2009. For a very long time, the only work listed by her was the Two Duos for Violin in C-major. Very cool, but not very...hefty, for lack of a better word. - being taken seriously as an artist in eighteenth-century Europe. Sometimes I get exasperated that our historians have fallen asleep at the wheel. A few recordings of Maddalena's work have found their way onto Youtube. Not that I'd endorse you doing this kind of thing (cough), but you can go there and search for "Sirmen violin" and see what you can find. If you like what you hear, buy the set. The tracks appear to be available through the Naxos Music Library and Itunes. According to this book, Maddalena's six violin concertos date from around 1768. They are the work of an assured, accomplished, and ambitious young woman in her early twenties. (There are parallels here with Mozart's...his famous set of five would come around 1775, when he was in his late teens. Fascinatingly, in 1778, Wolfgang's prickly, perfectionist father Leopold actually praised one of Maddalena's concertos in a letter to his wife and son.) Maddalena's works remained in print for sixty years. It appears they only fell out of favor once the Romantic Era came whirling through the European music scene. Methinks her work is due for a resurrection. I hear you already. You want to know, are these concertos any good? *shrug* I think they are. Are they masterpieces? I'm not in the business of arbitrating masterpieces. (Besides, are only masterpieces worth knowing? And is the definition of an eighteenth-century masterpiece different than our own? What has the idea of a Sacred Immutable Steadily Progressing Western Canon of Art Music done to our ability to absorb and enjoy music of this era? Lots of thorny questions here.) Do I think Maddalena's concertos are fresh, engaging, and clever? Yes, yes, and yes! Do they deserve a larger audience? Yes, absolutely! Are they written well for the violin, and are they very difficult to learn? We'll see; I'm printing out the score to the fifth concerto and putting it on my music stand. I can tell one thing already: the lady liked her trills. This series will not have a set number of installments or a preordained direction... It will just be a touchstone topic as I explore various related subjects: the fifth violin concerto of Maddalena Lombardini Sirmen, her mysterious biography, eighteenth-century performance practice, and my feelings about the process of adopting, studying, and resurrecting an infrequently played work. If you're a violinist looking for a new and quirky challenge, feel free to join me! The sheet music to Maddalena's six violin concertos is available for free on IMSLP. This is an edit of an entry that originally appeared at my blog Song of the Lark. Very interesting topic. One of the most outstanding aspects of Venetian history is the formation and maintenance of the four opedali and the care of the orphans and cast offs that they engaged in. The Pieta is still in business I found out a few years ago. What a tragedy that there has not been found even one diary or autobiography of any of the female musicians from the ospedale. Looking forward to your next installment. By the way, as an aside to the subject, Micky White's new book on Vivaldi has been published and released. Check out her string quartets-- written about the same time as Haydn's early quartets, and quite interesting in comparison. The are published by Hildegard Publishing Co. and have been recorded by the Alegri String Qartet for Cala Records. Thank you for this! I look forward to the next installments. If you find pieces that might be appropriate for those say, stuck in Suzuki Book 4, please tell us about them. I'd love to try and play the pieces you are discovering, but don't have the skill level yet. Hi Rachel! Try her first trio sonata I don't think a recording is easily available (although I could be wrong on that), but if you want to hear what it sounds like before you learn, you could always input the notes into a free program like Finale Notepad.